It keeps changing. As climate scientists learn more, they update the science. When the Kyoto Protocol treaty on curbing GHGs was signed, Methane (CH4) was listed with a GWP of 21. Since that time, it’s been updated to 25, but those countries that signed the treaty are legally bound to treat it as 21. That’s why you’ll see it both ways. The Earth, like the other planets in the solar system is surrounded by an atmosphere composed of gases. Some gasses are called Greenhouse Gases (GHGs) because their molecules are able to absorb infrared light—the invisible, high-energy part of light from the sun. The most common GHG is carbon dioxide. When light from the sun hits the earth, it is bounced back out to space in the form of infrared light. The very small amount (.03%) of carbon dioxide in our atmosphere, along with even smaller amounts of the other GHGs, absorb some of this infrared light energy, and then radiate it out as heat, warming our atmosphere. Simply put, a photon—essentially a small “chunk”—of infrared light energy hits the gas molecule and makes it vibrate. This vibration is heat energy, which warms the surrounding atmosphere. This mechanism is responsible for maintaining the Earth at a temperature that is suitable for life. Without GHGs, our planet would have an average temperature of 0° Fahrenheit (-18° Celsius); because of their warming influence, the earth has a relatively balmy average temperature of 57° Fahrenheit (14° Celsius). There are only a few Greenhouse Gases—37 total out of the thousands of chemical compounds. Some remain in the atmosphere for a long, long time. Some of them are broken down and gone in less than a year. Some of them absorb just one frequency of infrared light, while others can absorb many different frequencies of infrared and thus are much, much more powerful GHGs. The International Panel on Climate Change (IPCC) convened by the United Nations has developed a scale for expressing how powerful a gas is at warming the atmosphere. This number is called the Global Warming Potential (GWP) of the gas. Carbon is the weakest, as well as the most common, GHG and it has a GWP of 1. Every other gas is given a number showing its power in terms of multiples of the power of carbon. Methane has a GWP of 25, because it is 25 times as powerful as carbon. Sulfur hexafluoride has a GWP of 23,900 because it is such a vastly more powerful greenhouse gas. Fortunately, it is in short supply. When we talk about the impact of GHGs, we usually speak in terms of carbon dioxide equivalents or “CO2e”. 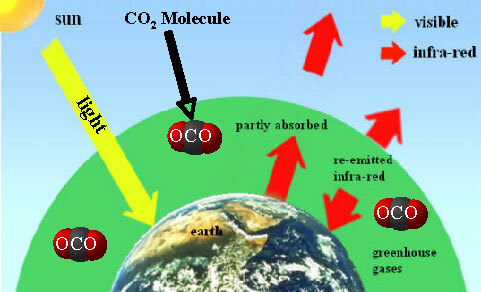 CO2e is a way of expressing the impact of all the GHGs in terms of CO2 by multiplying out their Global Warming Potential. For example: Human-caused GHGs are often referred to as anthropogenic (anthropo = man, genic = created) GHGs and they come from many sources. Carbon Dioxide [CO2] 84% of US GHGs 74% of Global GHGs By far, the most common GHG, CO2 is emitted naturally through the carbon cycle from sources such as volcanoes and through human activities like the burning of fossil fuels – which have increased the concentration of CO2 in the atmosphere by 35% since the 1700s. Methane [CH4] 8.6% of US GHGs 16% of Global GHGs Methane is emitted from a variety of both human-related and natural sources. In the United States, the largest methane emissions come from the decomposition of wastes in landfills, ruminant digestion and manure management associated with domestic livestock. It is estimated that more than 60 percent of global methane emissions are related to human-related activities (IPCC, 2007:a). Natural sources of methane include wetlands, gas hydrates, permafrost, termites, oceans, freshwater bodies, non-wetland soils, and other sources such as wildfires. Nitrous Oxide [N2O] 5.4% of US GHGs 9% of Global GHGs N2O (also known as “laughing gas” from its use in dentistry as an anesthetic) is emitted during agricultural and industrial activities, as well as during combustion of fossil fuels and solid waste. Nitrous oxide (N2O) is produced by both natural and human-related sources. Primary human-related sources of N2O are agricultural soil management, animal manure management, and sewage treatment,. Nitrous oxide is also produced naturally from a wide variety of biological sources in soil and water, particularly microbial action in wet tropical forests. Hydrofluorocarbons, perfluorocarbons, and sulfur hexafluoride are synthetic, powerful greenhouse gases that are emitted from a variety of industrial processes. Fluorinated gases are sometimes used as substitutes for ozone-depleting substances (e.g. CFCs, HCFCs, etc.). These gases are typically emitted in smaller quantities, but because they are potent greenhouse gases, they are sometimes referred to as High Global Warming Potential gases (“High GWP gases”). There are three major groups or types of high GWP gases: hydrofluorocarbons (HFCs), perfluorocarbons (PFCs), and sulfur hexafluoride (SF6). These compounds are the most potent greenhouse gases. In addition to having high global warming potentials, SF6 and PFCs have extremely long atmospheric lifetimes, resulting in their essentially irreversible accumulation in the atmosphere once emitted. Hydrofluorocarbons (HFCs) HFCs are man-made chemicals, many of which have been developed as alternatives to ozone-depleting substances (ODS) for industrial, commercial, and consumer products such as automobile air conditioning and refrigeration. The global warming potentials of HFCs range from 140 to 11,700. Perfluorocarbons (PFCs) Primary aluminum production and semiconductor manufacture are the largest known sources of two man-made perfluorocarbons – CF4 (tetrafluoromethane) and C2F6 (hexafluoroethane). The GWP of CF4 and C2F6 emissions is equivalent to approximately 6,500 and 9,200 tonnes, respectively. PFCs have extremely stable molecular structures and are largely immune to the chemical processes in the lower atmosphere that break down most atmospheric pollutants. Not until the PFCs reach the mesosphere, about 60 kilometers above Earth, do very high-energy ultraviolet rays from the sun destroy them. This removal mechanism is extremely slow and as a result PFCs accumulate in the atmosphere and remain there for several thousand years. The estimated atmospheric lifetimes for CF4 and C2F6 are 50,000 and 10,000 years respectively. Sulfur Hexafluoride The global warming potential of SF6 is 23,900, making it the most potent greenhouse gas the IPCC has evaluated. SF6 is a colorless, odorless, nontoxic, nonflammable gas with excellent dielectric properties. SF6 is used for insulation and current interruption in electric power transmission and distribution equipment, in the magnesium industry to protect molten magnesium from oxidation and potentially violent burning, in semiconductor manufacturing to create circuitry patterns on silicon wafers, and as a tracer gas for leak detection. Like the other high GWP gases, there are very few sinks for SF6, so all man-made sources contribute directly to its accumulation in the atmosphere. Measurements of SF6 show that its global average concentration has increased by about 7% per year during the 1980s and 1990s (IPCC, 2001).